Do Tummy Time. Tummy Time is crucial for baby’s development and you can start as soon as you get home from the hospital. Even though Tummy Time is like a workout for baby, you can make it fun for them too! Tummy to tummy is a popular tummy time move to engage and bond with baby during this time. Incorporate rattles and toys to make it more exciting for baby! Show baby around. You can carry baby around the house with you and play in other fun positions like on the floor during Tummy Time. Remember, everything is new and exciting for them, and different heights provide different views for baby! Be sure to point out objects, shapes, and colors. Talk with baby. Even though baby doesn’t understand you, they will know your voice! 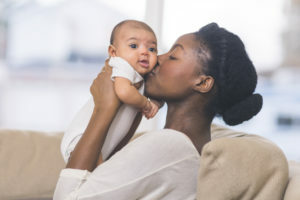 This early communication is important, and hearing you describe objects and talk about what you’re doing will help baby’s communication development. During baby’s first year they will be cooing and babbling. Be sure to respond to baby’s coos to reinforce that you are listening and that communication is a two-way street. Baby loves faces. Face to face play with baby is a primary way to incorporate faces in play! Baby will enjoy looking at your face and making eye contact. Showing them faces in books, on their dolls or stuffed animals, and in pictures will delight them. Sing songs and smile, and baby will laugh and smile back at you. You can also use mirrors to look at yourselves together. Overall, remember that it is okay to be silly when playing with baby. Talking about what you are doing and singing songs can make everyday activities fun for baby. For even more activities visit our Baby Games Calendar. You can enter your child’s birth date and get new games each week to help baby reach their developmental milestones! After all of this playing, baby will be tired. When baby sleeps try to get some rest as well, but remember the ABCs of safe sleep. When is your baby going to smile? We know you can’t wait. Learn more about their smiling faces. 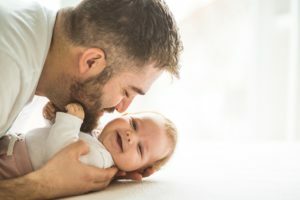 Check out even more ideas for bonding with your baby!